An international driving permit is a must to Overseas Filipino Workers (OFWs) who works as a driver or those who frequently travel to different countries. 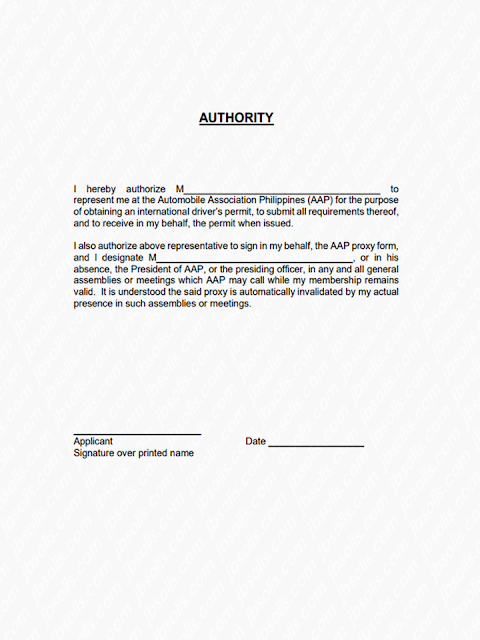 The only way to acquire it in the Philippines is through the Automobile Association of the Philippines (AAP). You should apply for a membership and they will help you obtain your international driving permit. 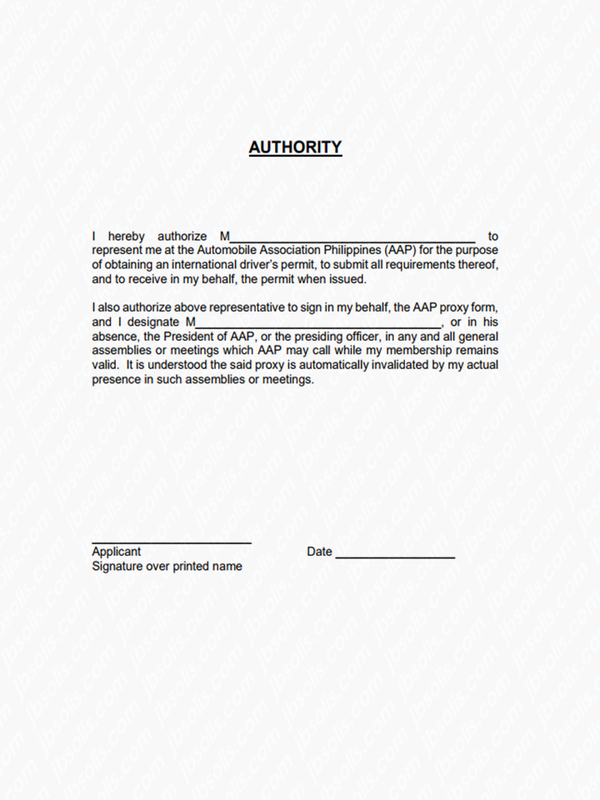 —Original and photocopy of Philippine Driver’s License valid for at least one (1) year. —Two (2) pieces latest 2×2 colored ID photo with white background. —Foreign nationals, dual citizens and Filipino citizens born in other countries present the original passport plus photocopies of pages showing identification and date of last arrival. If you are a permanent resident, present your passport and/or Alien Certificate of Registration (ACR). —Registration along with requirements no. 1 and 2. — Go to any AAP office and fill -up the application form. Do not leave any blank sections. If the information is not applicable for you, put "NA". 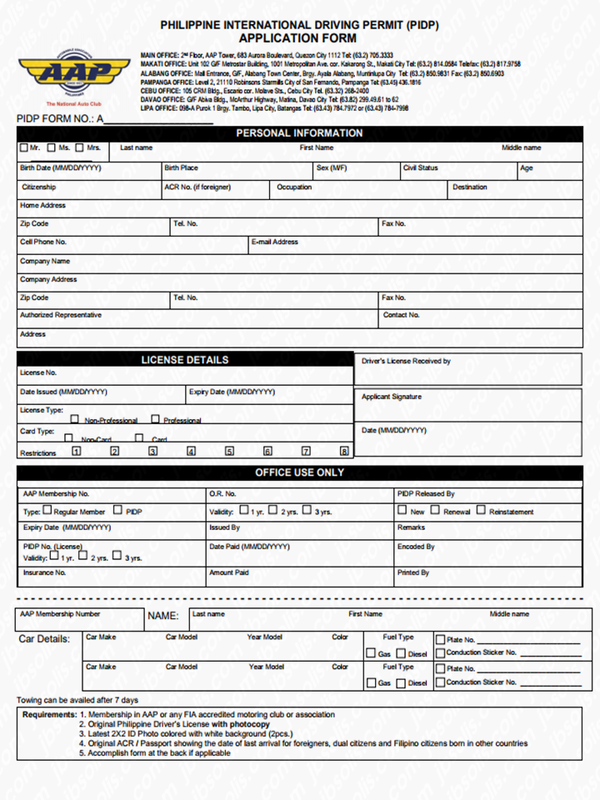 The application form can be downloaded from their website. — Submit the original and photocopy of your valid Philippine drivers license together with two pieces 2x2 colored ID photo taken on a white background. The validity of your international driving permit is one year from the date of issue or depending on the validity of your Philippine driver's license. If your Philippine driver’s license is valid for more than one year, the PIDP will be valid for one year from the date of issue. If your Philippine driver’s license is valid for less than one year, the PIDP will follow the validity of your Philippine driver’s license. If your PIDP expired while you were still abroad, you can renew your PIDP online by visiting the AAP Website as long as the card type Philippine license that was presented before has not expired yet. If a temporary license was presented, the photocopy of the temporary license together with the original LTO Certification and Official Receipt should also be presented. Did You Apply for OFW ID and Did You Receive This Email?